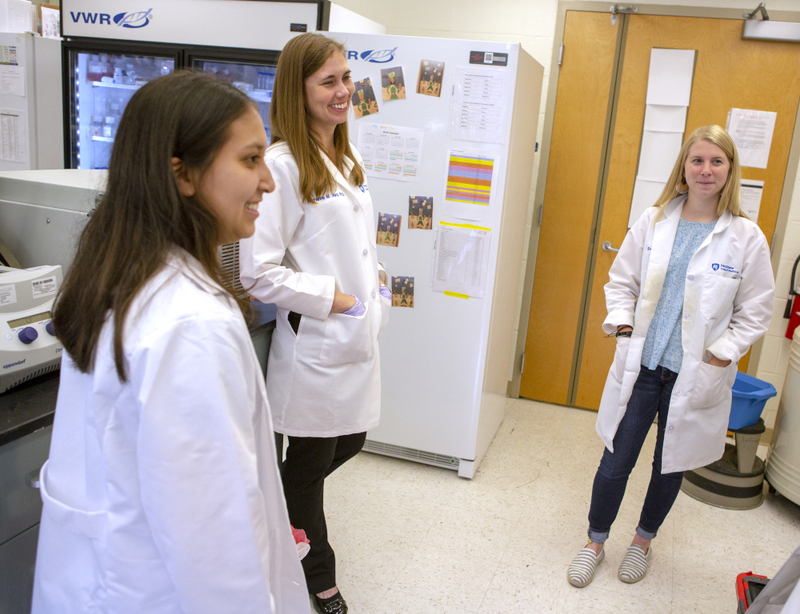 Katherine Aird, center, assistant professor of cellular and molecular physiology at Penn State College of Medicine, interacts with members of her team. From aging to cancer—with quite a bit in between—Katherine Aird, assistant professor of Cellular and Molecular Physiology at Penn State College of Medicine, and her team have a whole world of research opportunities in front of them. This is not just because they have a lot yet to discover, as Aird insists they do, but because the progress they have made has incredibly broad potential impact. The team’s latest research reveals that skin, pancreatic, bladder, ovarian and colorectal tumor cells may share a common target for new therapy approaches. In each cancer type, forcing a particular change in the cell’s metabolism (how it uses nutrients) may shut off or suppress its growth, essentially putting it to sleep. This forced sleep state is known as senescence, and together with cell metabolism, it makes up the heart of Aird’s research. Unfortunately, that emergency shut-off isn’t the final destiny of some cells. Other things can happen that may change the cell yet again, causing it to lose that stopper and, in rare instances, start a tumor. In the case of skin cancer, where this concept is best understood, the example often used to describe the concept is that of a sunburn and a mole. Some moles are made up of senescent skin cells that are critically damaged but shut off. However, if something like a sunburn occurs and causes yet another mutation in the cell or its metabolism, it may kick off cell growth that leads to cancer. Aird and her team’s latest findings, which appear in a pre-print manuscript available on BioRxiv, suggest it may be possible to force that process to happen in reverse—putting tumor cells to sleep—or to otherwise kill cells living in the altered metabolic state. Since this process of how cells eat and sleep, so to speak, appears to be important in several cancer types, Aird has now brought her lab’s investigations to bear on ovarian cancer, which is the deadliest gynecological disease and one of the least understood cancers. These two cell activities are also linked to the general process of aging and age-related diseases, including poor vision, arthritis and even Alzheimer’s disease. Learn more about Aird’s research in this Penn State Medicine article.